UR Medicine’s Strong Memorial Hospital has been recognized by Becker's Hospital Review in its 2016 list of 100 Hospital and Health Systems with Great Neurosurgery and Spine Programs. This is the third consecutive year that the department has received this honor. “This recognition is a testament to the dedication and excellence of our faculty, nurses, and staff and their commitment to provide the highest level of care to patients in our region,” said Webster Pilcher, M.D., Ph.D., the Ernest & Thelma Del Monte Distinguished Professor of Neuromedicine and chair of the Department of Neurosurgery. Strong Memorial Hospital is a designated Blue Distinction Center+ for Spine Surgery and is the region’s only Comprehensive Stroke Center, as designated by the Joint Commission and the American Heart Association/American Stroke Association. The hospital is also home to the area’s only dedicated 24/7 Neuromedicine Intensive Care Unit. Tarun Bhalla, M.D., Ph.D., has been named director of Stroke and Cerebrovascular Services in the Department of Neurosurgery and director of Inpatient Stroke and Cerebrovascular Services at UR Medicine. Bhalla, who was also appointed assistant professor in the Departments of Neurosurgery, Neurology, and Imaging Sciences, began his position on August 1, 2016. Bhalla joins URMC from Geisinger Medical Center in Danville, PA where he served for three years as the director of Cerebrovascular and Endovascular Neurosurgery. He received his M.D. and Ph.D. from the University of Connecticut and did his residency training, as well as a fellowship in surgical endovascular neuroradiology, at the Cleveland Clinic. His specialties include cerebrovascular and endovascular treatment for stroke, aneurysms, arteriovenous malformations (AVM), carotid/vertebral artery disease, and a chronic facial pain called trigeminal neuralgia. Bhalla will join the UR Medicine’s Comprehensive Stroke Center. Strong Memorial Hospital is the only institution in the region designated by the Joint Commission and the American Heart Association/American Stroke Association as a Comprehensive Stroke Center. His appointment will expand the Center’s team of endovascular surgeons. In recent years, stroke care undergone a shift in care with studies showing that endovascular procedures – during which surgeons remove clots in the brain via a catheter fed through blood vessels – may result in better outcomes for some patients compared to care involving only clot busting drugs. His appointment comes on the heels of several new investments in stroke and cerebrovascular care at Strong Memorial Hospital, including a new Hybrid Operating Room and Angio Suite designed to offer minimally invasive neurosurgical procedures, a new surgical technology to treat hemorrhages deep inside the brain, and a dedicated Neuromedicine Intensive Care Unit. Bhalla will help lead efforts to expand stroke care, including working with community providers and emergency medical technicians to diagnose and potentially begin treatment for stroke patients before they reach the hospital. The American Heart Association/American Stroke Association has once again honored UR Medicine’s Strong Memorial Hospital with its highest awards for heart failure, stroke and resuscitation care. Strong Memorial is the only Rochester-area hospital to earn the highest levels of recognition for these categories of care. 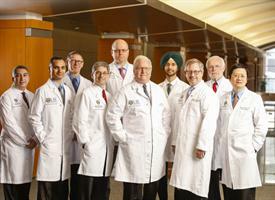 Strong Memorial earned Get With the Guidelines Heart Failure Gold Plus and Target Heart Failure Honor Roll Award, Stroke Gold Plus and Target Elite Plus Honor Roll Award and Resuscitation Gold Award in the AHA/ASA’s hospital-based quality improvement program. Each year in the U.S., approximately 735,000 people suffer heart attacks, 5.7 million people endure heart failure and nearly 800,000 people suffer a stroke, according to the American Heart Association/American Stroke Association. The GWTG program is designed to measure outcomes and adherence to treatment guidelines to ensure high quality care at hospitals across the nation.